The next time your boss says, "Handle it …" will you be ready? Do you feel 100% confident managing projects, people, and situations independently? It's a fact: If you want to be an "exceptional assistant" — a fully contributing member of your team — you need good management skills to survive and thrive. You need skills like project management techniques … the ability to negotiate well … decision-making acumen … and the ability to manage change, plus many other skills you might think only managers need. 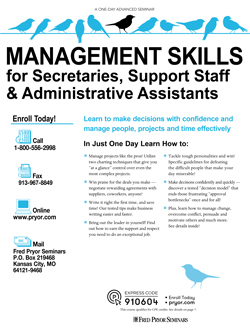 In this exciting, one-day seminar, you'll learn the powerful tricks of the management trade — high-impact approaches that will give you the power and knowledge to "handle your administrative assistant duties with confidence." In this secretary training, you'll master planning and scheduling solutions that give you more control over your time and energy. Not only will you be able to take on special projects, you'll do it without missing a beat in your everyday tasks and daily routine. If you've answered YES … this management skills seminar is tailor-made for you! Planning particulars: the who, what, when, where and how of indispensable work plans. Step by easy step, we'll show you how! Working with suppliers and vendors: a four-step plan that enhances your purchasing effectiveness and improves the customer-supplier relationship! Strategies for power persuasion: how to get your point across, win support and get people on your "bandwagon."